In a time of economic weakness, public investments in our nation's infrastructure can provide short-term stimulus while also building the foundation for long-term economic growth. The Economic Policy Institute sponsored a timely forum on Investing in U.S. Infrastructure to address critically needed federal investments in infrastructure, including transportation, school buildings, and information networks. Gov. 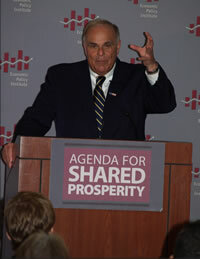 Edward Rendell is making Pennsylvania a leader in pursuing energy independence — creating jobs in the emerging alternative energy economy while developing effective strategies to reduce dependence on foreign oil. He won passage of the landmark Growing Greener 2 environmental investment package to clean up rivers and streams, improve parks, return abandoned industrial sites to productive use, protect open space and preserve farmland. Congressman Earl Blumenauer, (D-OR). During the past year he has held a series of briefings and seminars on the nation's infrastructure needs and is one of the top experts in Congress on this issue. A member of the Ways and Means Committee, the Budget Committee and the new Select Committee on Energy Independence and Climate Change, he is a strong and creative voice both at home and abroad for the environment, sustainable development, and economic opportunity. Mary Filardo, Executive Director, founded the 21st Century School Fund in 1994. She discussed the economic and educational benefits of federal funding to build and repair public schools. Mark Lloyd, Vice President of Strategic Initiatives at the Leadership Conference on Civil Rights and Affiliate Professor of Public Policy at Georgetown University. A frequent contributor to both academic and popular publications, and he is the author of the 2007 book Prologue to a Farce: Communication and Democracy in America. John Irons, Research and Policy Director for the Economic Policy Institute and the Director of the Agenda for Shared Prosperity, moderated the forum.